And, because riders are largely inexperienced, that usually means accidents. But, since we’re in the early stages of the city’s scooter regulations, the question of who’s at fault in scooter accidents isn’t as clear-cut as you would think. Last month, KUT host and producer Rebecca McInroy learned this the hard way while leaving a parking garage on UT's campus. "Driving out, I put my parking pass in, waved to the attendant that was there," she said. "I slowed down, stopped looked to my right to make sure no one would hit me. Then suddenly I hear this ‘woo-poosh!' And I see this guy fly on to my car and then jump around, and he was on a scooter. So, I see the scooter lying there." At that point, things proceeded as they would normally after a crash. Police and EMS were called. The man on the scooter was injured, but declined to leave in an ambulance. McInroy said the police told her they see a lot of these types of accidents, but don't know what to do. "They see a lot of accidents with scooters and they don’t know if they’re supposed to ticket them if they’re riding on the sidewalk," she said. "They don’t know if they’re supposed to ticket them for not wearing helmets. They don’t know what the protocol is when they are in an accident." "None of the insurance you have currently is probably going to help you." Austin Police Sgt. Michael Barger said a lot of this is new for any officer – but it's expecially difficult for the department's newer ones. "You have the brand-new officer, who just got out of the academy and they may teach about scooters in the academy, so he’s going to be knowledgeable," he said. "Then you have a guy who has been out for a year and came out just before scooters came out, and he has no idea how to handle a scooter [incident]. And then you have officers with more experience and going, 'Well, that’s a bicycle.' They’re understanding that a scooter is handled just like a bicycle. It’s just a logical process for them." Right now, the State of Texas considers e-scooters the equivalent of bikes: They have two wheels, go under 30 miles an hour and can be operated with little training. Also, theoretically, there is less risk of injury. "In medical coding now, there is a very specific code for two-wheeled, motorized scooters," said Dr. Melinda McMichael, interim director at the University Health Center at UT Austin. "So, it’s very distinct from motorcycles, bicycles, un-motorized scooters, skateboards, so there’s a very specific code." McMichael said her clinic has been keeping tabs on scooter injuries that come through her facility since school started. The number of incidents has grown every month: 26 in September, 32 in October and 22 as of Nov. 15 with two more weeks to go in the month. "What we normally see people for are knee injuries, sprained ankles, lacerations, abrasions, head injuries," McMichael said. "But I’d think it’s important to point out that this doesn’t count the people that went straight to the emergency room. So, my guess is the numbers are much higher than this." Barger thinks the scooters help get cars off the road, but there might be more restrictions on them down the road because of those injuries. Bernard Love, a pedicab driver for Austin Pedicab, waits for customers on Oct. in front of Container Bar on Rainey Street as an e-scooter zips along. "You have people that are getting on these scooters," he said. "They have no experience riding them. They get up to 15 to 20 miles an hour. It’s a dangerous mode of transportation – mainly because it’s got a high center of gravity, because you are standing up as you ride on it. And if you hit a pothole, you’re going to go over the handlebars on it." But until something changes, the law is murky on scooters. The University of Texas Police Department has not issued citations for scooter-related offenses – unless it was particularly egregious. The department is trying to educate riders that they must follow the rules of the road, since scooters are vehicles. That is, unless scooters are involved in a crash with a motorized vehicle. 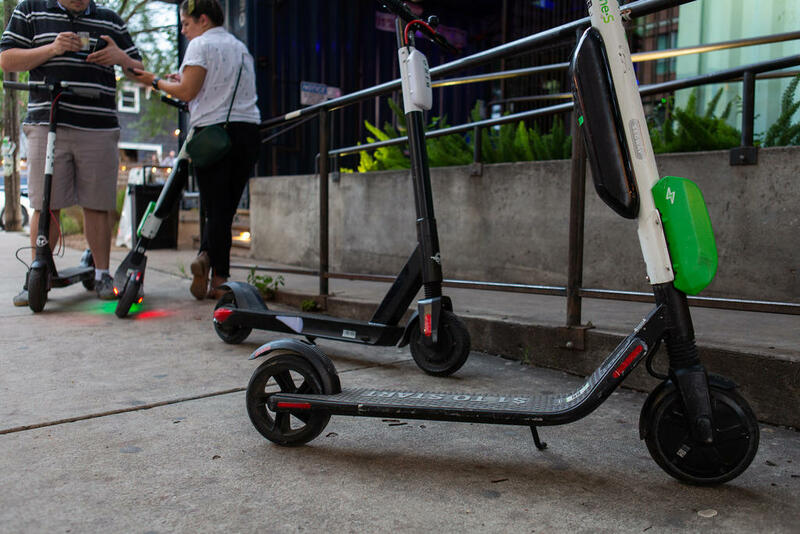 "The way they see the scooters is almost like a pedestrian or a bicyclist, because they’re not required by law to carry liability insurance," said UTPD Officer Robert Rodriguez. "It becomes a civil matter at that point between the driver of the vehicle and the person riding the scooter." Scooter companies all carry liability insurance that protects the company. There’s no comprehensive insurance that would cover the damage that a scooter can cause. The companies don’t cover the rider at all. And there’s a good chance that, even if you have a solid homeowner’s or renter’s insurance policy, you’re not covered for any damages here either. "None of the insurance you have currently is probably going to help you," said Jason Hargraves, managing editor for InsuranceQuotes.com. "Because your homeowner's policy does carry with you for some instances, for liability purposes, except when it involves a motorized vehicle. And that’s exactly what a scooter is." So, in the eyes of homeowner-policy issuers, the scooter is a motor vehicle. McInroy's SUV had a large dent on the left side and her driver side door was hard to open because things were out of place. She called her auto insurance company to file a claim. "They didn’t really know what to do about it," she said. "They said, ‘We’re not really sure what to file this under, but we will contact him.’ Then when I called back to check in on it, they said they forgot where it was, because it had been filed under a motorcycle accident, because they didn’t really understand how to classify the scooter idea." But then, days later, it took a turn. "[The insurance agent] said ‘We have to wait for the police report, because [the scooter rider] said that you hit him,’" she said. "And I was taken aback because he hit the side of the car, so, really I could not have hit him. But, having said that I hit him, that would make it my fault, and they said then it would be on my file as hitting a pedestrian, which is not a good thing to have on your record." But then McInroy remembered the garage attendant mentioned the crash would have been recorded by the security cameras. "Then I sent that to my insurance company," McInroy. "After [the agent] watched it she said, ‘Uhh, clearly he’s at fault.’"
She was still out a deductible, but there's no huge scar on her file. It’s final classification? The guy on the scooter – was an uninsured motorist. Dockless vehicle providers now have rules for operating in Austin after a City Council vote early this morning, giving providers a framework to deploy dockless bikes and scooters legally by as soon as next week. 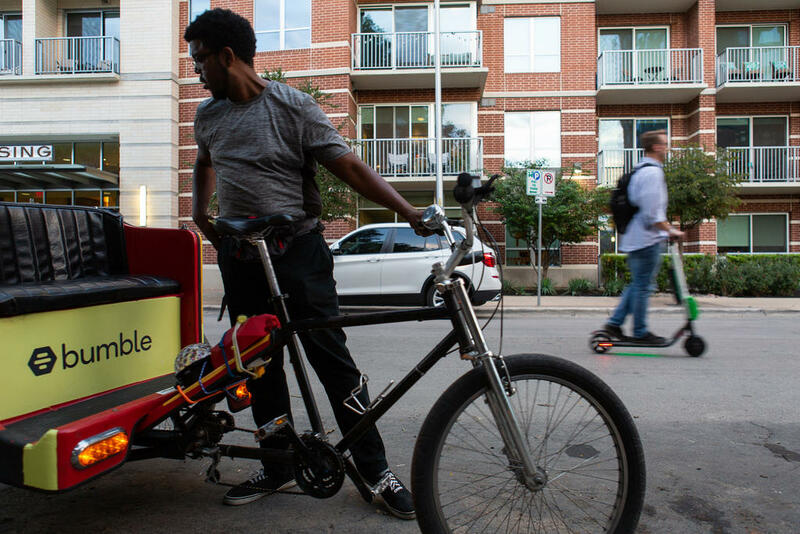 The unanimous vote rolls dockless vehicles into a city ordinance banning abandoned vehicles from blocking rights-of-way like sidewalks and sets up a framework to penalize dockless vehicles operating illegally in Austin. Jumping the gun works, it seems. While city staff were devising a pilot program to govern dockless bikes and scooters, expecting to bring a proposal to council members in June, two companies dropped their electric scooters throughout the city. Now the Austin Transportation Department has proposed fast-tracking approval of the pilot program.